Star Wars has been a cultural phenomenon for over 40 years. Why not dress the part? I’ve got 101 amazing Star Wars costumes for the whole family! I’ve been a fan of Star Wars nearly my entire life. I have so many amazing memories from skipping school to waiting in line for tickets to the Phantom Menace with my mom to seeing the Force Awakens with Ashley an hour after her first ultrasound for Lily. Now that Lily is getting older, she is starting to get into dress up. 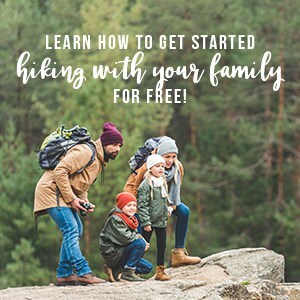 So why not get the whole family involved? I’ve got the whole family covered. I’ve got 101 Star Wars costumes for infants, Star Wars costumes for toddlers, Star Wars costumes for boys and girls, and Star Wars Costumes for men and women. And while we’ve got your whole team dressed up, don’t forget Star Wars Costumes for dogs! These costumes are perfect year-round for dress up, Halloween, and Star Wars Cosplay at events like Star Wars Celebration! And to make it even better, most of the costumes are free 2-day shipping with Amazon Prime. 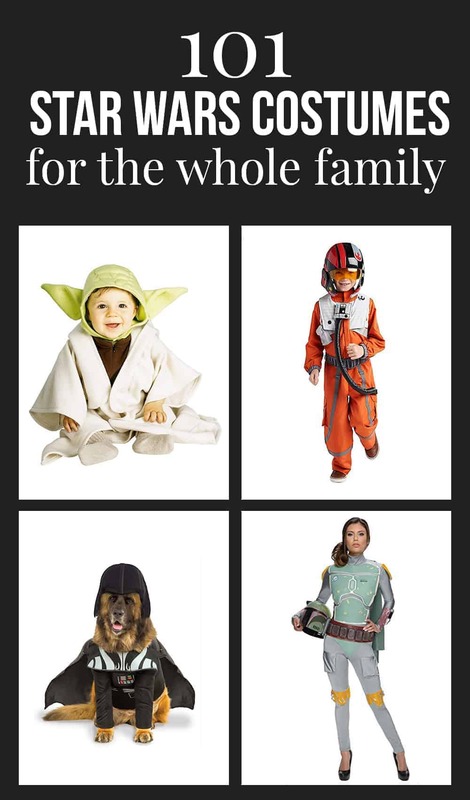 So get clicking and dress up the whole family with your favorite Star Wars costumes. As the only apprentice of Anakin Skywalker, Ahsoka Tano aka Snips always has a comeback for her master. One of the few Jedi in Star Wars to wield duel lightsabers, Ahsoka Tano made her appearance in the Clone Wars movie. Her fate in the Clone Wars series was left uncertain but she reappeared in Star Wars Rebels as a Grey Jedi. Known as the chosen one, prophesy said that Anakin Skywalker would bring balance to the Force. Anakin’s life went down a dark path when he turned to the dark side of the Force in an attempt to save his pregnant wife Padme. Although he became the dreaded Darth Vader, Anakin Skywalker redeemed himself in the end when he destroyed Emperor Palpatine to save his son Luke Skywalker. A fan favorite since he first debuted in the teaser trailer to the Force Awakens. BB-8 is an astromech droid and the companion of Poe Dameron. Boba Fett aka the most skilled bounty hunter in the galaxy is the unaltered clone of his “father” Jango Fett. After his father’s demise at the hands of Mace Windu on Geonosis, young Boba Fest commandeered his father’s ship Slave-1. He is most famous for delivering Han Solo to Jabba the Hutt. Captain Phasma is one of the leaders of the dreaded First Order. She is famous for both her ruthlessness and her silver armor. Standing over 7 feet tall, Chewbacca the Wookie towers over everyone. After being freed from slavery by Han Solo, Chewbacca swears a life debt to the smuggler. They become life long friends. Clone Troopers made up the bulk of the Grand Army of the Republic. Every Clone Trooper was a clone of the feared bounty Hunter Jango Fett. Secretly programmed by Darth Sidious, the Clone Troopers turned on their Jedi commanders during order 66. After that, they became the dreaded Storm Troopers of the Galactic Republic. Once the apprentice of Master Yoda, Count Dooku turned to the dark side of the Force. He became the apprentice of Darth Sidious and the leader of the Separatists. Perhaps the most infamous villain in movie history, Darth Vader was the second in command of the Galactic Empire. He redeemed himself in the end and once again became Anakin Skywalker when he saved his son Luke from Emperor Palpatine. Death Troopers were elite Storm Troopers clad in black. One squad of Death Troopers were the personal guard of Director Orson Krennic on Skarif when it was attacked by the Rebel Alliance. Also known as FN-2187, Finn was taken from his family and raised as a Storm Trooper. After his first battle, he helped Poe Dameron escape to Jakku and became a hero of the Resistance. First Order Storm Troopers are the main fighting force of the first order. They are descended from both the Clone Troopers and the Imperial Storm Troopers. The most famous smuggler in the galaxy, Han Solo is known for making the Kessel run in 12 parsecs. Han Solo is the pilot of the Millennium Falcon with his trusted co-pilot Chewbacca. Jyn Erso was the hero of the battle of Scarif. She infiltrated the Imperial data archives, stealing the plans to the Death Star. She was able to send the plans to the Rebel Alliance before Scarif base was destroyed by the first Death Star. After young Ben Solo was turned by Supreme Leader Snoke to the dark side of the force, he becomes the dreaded Kylo Ren. After he and Rey defeated Snoke and his guards, Kylo Ren became the new supreme leader of the First Order. A smuggler and gambler, Lando Calrissian was the sometimes friend of Han Solo and the administrator of Cloud City. After betraying Han Solo to Darth Vader, Lando later redeemed himself by helping Leia free Han Solo from Jabba the Hutt. Luke Skywalker is the brother of Leia Organa. Raised by his Aunt and Uncle on Tatooine, he embarks on his quest to help Princess Leia after purchasing C3PO and R2-D2. He becomes a Jedi Knight and helps defeat emperor Palpatine with the help of his father, Darth Vader. Obi Wan Kenobi was a Jedi General and hero of the Galactic Republic. After Order 66, he watches over young Luke Skywalker and later helps train him as a Jedi Knight. Padme Amidala became Queen of Naboo at the age of 14. She late became the Senator from Naboo to the Galactic Republic. Padme secretly married after falling in love with Jedi Knight Anakin Skywalker. She is the mother of twins Luke Skywalker and Leia Organa. Poe Dameron is the best pilot in the resistance. He helps destroy Starkiller Base and later helps what remains of the Resistance escape the First Order. Porgs are the lovable creatures from the planet Ahch-To that befriend Chewbacca. They instantly became famous when they made their debut in the teaser trailer for the Force Awakens. R2-D2 is the friend and astromech droid of Luke Skywalker. He is one of the most recognizable characters in Star Wars. He is also one of only two characters to appear in every numbered Star Wars movie. Rey was a junker abandoned by her parents on Jakuu. She then met BB-8 and Finn as they escaped Jakku. Rey was later captured by Kylo Ren and taken to Star Killer base where she learned of her latent force abilities. She defeated Kylo Ren in combat with Anakin Skywalker’s lightsaber. Later she sought out Luke Skywalker and became the last Jedi. Storm Troopers were the main fighting force of the Galactic Empire. They were descended from the Clone Troopers. The most elite Storm Troopers became members of the 501st Legion also known as Vader’s fist. Jedi Master Yoda was the leader of the Jedi Council. He went into exile after failing to defeat Darth Sidious. Later he trained Jedi Knight Luke Skywalker. What Star Wars family would be complete without this amazing collection of Star Wars costumes just for dogs! Looking for more inspiration for your next Halloween party? Try these awesome decor items: Paper Plate Halloween Sign DIY, Halloween Piñata DIY, and this Halloween Cheesecloth Ghost DIY. We’ve also got some great feet treats and party food. Be sure to try these Halloween Banana Pudding Parfaits, Copycat Harry Potter Pumpkin Juice, and glow in the dark Chocolate Creamsicle Bars. Have a tone of extra candy on hand? Try these 49 Recipes to Make with Leftover Halloween Candy!